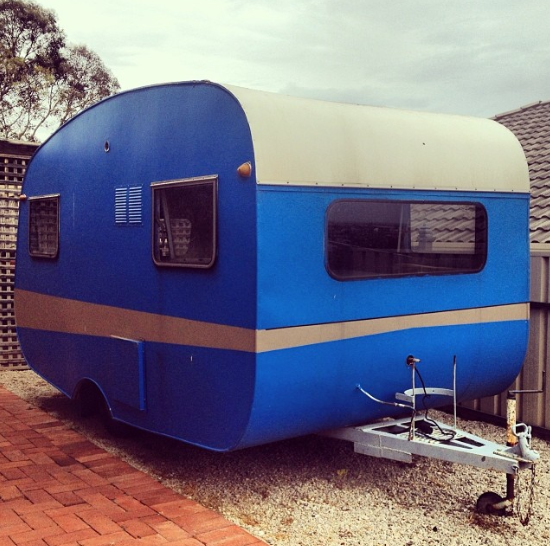 I recently purchased a 1960s caravan with bags of personality and plenty of potential. She is part mobile studio, part teeny-tiny home, part writing project called ‘The Little Local’. That’s me… a little country girl turned urban dweller with big ol’ dreams. Sometimes a ‘calling’ nibbles away at you for so long you simply can’t ignore it. Mine just happens to be a big beast on wheels. The aim? To make my way around Australia, visiting small towns, meeting local characters and exploring the little gems that make Oz an eclectic wonderland. I’m talking about glorious finds you don’t read about in a travel book. The type of tips shared by the old man on the corner… once you’ve shared a cuppa or five and heard his colourful life story. I grew up in rural SA, pulling teats as a shy farmer’s daughter so it makes sense that SA will be our first wheel spinning stomping ground. I’m not so quiet these days so when wheels puncture or we get lost (I once followed a GPS down a sandy beach track so far I bottomed out on prickly scrub) it’ll be vented. Right here. That’s all part of the ‘journey’ right? Crazy characters will make guest appearances along the way. More on that later. My parents say I’ve always had a thing for collecting strays. Stray humans that is. There will be magic and mayhem around every dusty corner. As for the transformation of van from hazy shade of Smurf blue to beautiful shade of TBC. That’ll make up the first few digital scrawl fests in this here blog. I’m new to all this van shenanigans so we’ll learn (the hard way) as we go. One thing’s for sure, the transition from dusty old caravan to wonderland on wheels will be a bright one. You know, that bird Dorothy thought she had it all worked out with her ruby slippers, wicker basket, cute frock and fluff ball Toto but we’ll bring more sparkle, vintage kicks and sparkle to rural Australia than her and Priscilla Queen of the Desert put together.